There are two big gardens to visit on Madeira, and they are both on high ground. When we arrived, the clouds were covering the mountains where the gardens are, so we decided to wait for better weather before visiting. You can drive to the gardens, but they are best approached by the cable-car that leaves from the edge of Funchal, the main town. There are in fact two cable-cars; one that goes to the Tropical Gradens, (The Monte Palace Gardens) and the other that goes on from there to the Botanical Gardens. You can visit both gardens in one day, but we thought that the main one, the Tropical Gardens would be enough. Once you are ready to leave the Tropical Gardens, you can take a traditional sled ride down the mountain slope, guided and pushed by a couple of local lads. So 3-in-1: cable car, gardens, sled ride. The cable-car gives you spectacular views over the old town of Funchal, and takes you over the little houses perched on the valley sides. It leads to the entrance to the tropical gardens, where you can spend a whole day admiring the plants and landscaping. Originally, a funicular railway used to take you to the gardens, but it had a nasty accident and was replaced. The gardens are constructed in one of he steep-sided valleys that are a feature of the Madeira landscape. They make extensive use of the river that runs down, with small ponds, cascades and other water features. The garden furniture is Japanese in style. You can easily spend all day at the Tropical Gradens, so once we were "gardened out" we made our way back to the town. An option you can choose is to take the traditional toboggon ride part-way down. We did this on a different day, as part of a coach tour. The sledges don't take you all the way down, so it's a good idea to be ready to walk the rest of the way, or have a ride available. A short break in Madeira, a volcanic island off the coast of northern Africa. We were only there for a few days, to get some warmer weather and sunshine before our working season starts. The locals were friendly, and welcoming. If you look like a tourist (the camera slung over the shoulder was a giveaway) they will greet you in English first, followed by other languages if necessary. The restaurant menus are in at least 4 languages. This is in marked contrast to other tourist destinations where, if you don't at least attempt the native tongue, reception can be surly and grudging. So we will be back for a longer stay when we can. Being in the Atlantic, the climate is warm with realtively stable temperatures; little change between day and night, and a variation from 16°C Winter average to 23°C Summer average. First impressions were of a warm climate, with Banana, Opuntia cactus, Bougainvillia and Aloe plants growing wild. Narrow, steep-sided valleys with tiny rivulets at the bottom but great big concrete fingers standing up in them, presumably to calm the torrents that sometimes flow. The island has an indigenous population of about 250,000, and gets about 20 million tourists per year. I think it would be a bit crowded in high season, but in February it was not, and yet every tourist attraction that we wanted to visit was none the less open. Meanwhile in France, a cold snap. Last night in Paris there was chaos on the roads, as the snow that had been forecast for at least a week took everyone by surprise. It snowed here overnight too, about 10cm or so, but the air warmed up during the day, and much of it has melted. I took a short walk to see what was to be seen, but I missed the best of the snow. The Camelias are a bit early, but the Crocus are right on time. If the crow had stayed in the right place he'd have made a dramatic shilhouette. The Aurochs was more co-operative. Even the buildings benefit from being a bit spruced up. Ordinary plant life looks a bit more colourful, and trees look like snow fountains. We've had floods recently, in Paris and towns downstream. The waters are receeding now, but we're expecting a week of cold weather, with snow and sleet moving across France. 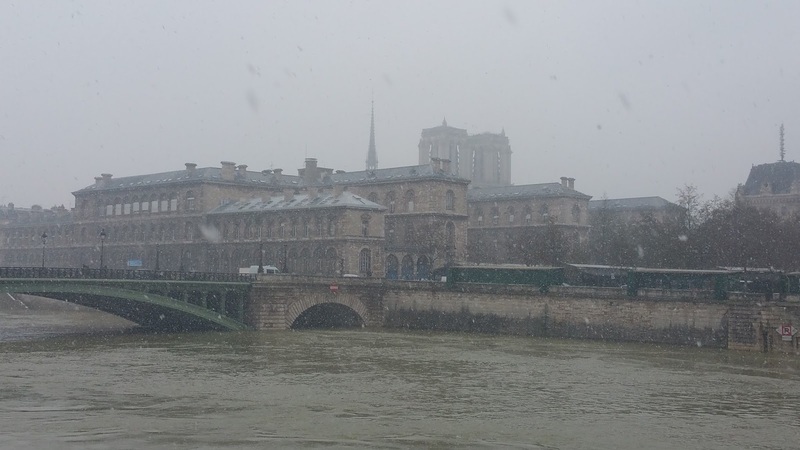 Today there were a couple of flurries in Paris. 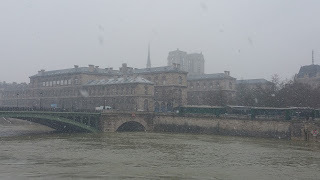 The Seine was flowing quickly but was nowhere near recent flood levels.